September will be remembered for two massive quakes in Mexico, four devastating hurricanes in the Atlantic, two tropical cyclones in the Pacific, deadly flooding in India and Bangladesh, two monster X-class flares and a spike in volcanic activity, September 2017 was probably the most devastating month in modern times with more than 50 million people evacuated around the world. In March 2011 the month of the mag 9.0 quake in Honshu Japan 73 major quakes was recorded around the world, in September 2017 the most devastating month in recent times only 10 major quakes occurred and one of them was caused by a nuclear explosion in North Korea. The average monthly total for major quakes in 2011 was 17, this year the average monthly total so far is 8, less than half. 2011 finished the year with a total of 207 major quakes which is the highest yearly total ever recorded since records began if this year continues to average 8 major quakes per month, 2017 would finish on 93, which is an astonishing 114 major quakes less than 2011. 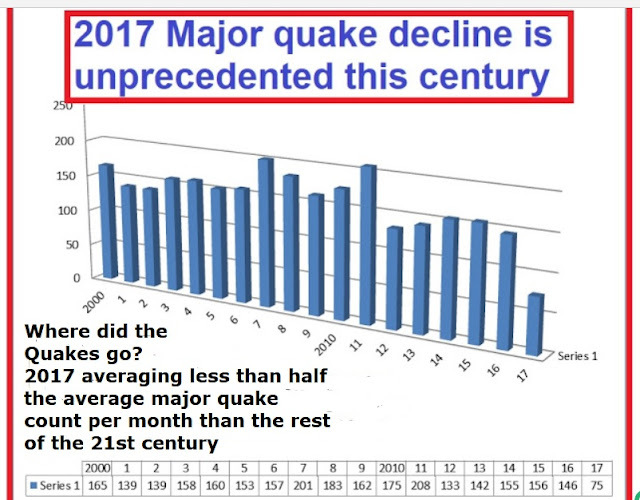 This century from Jan 1st, 2000 to December 31st, 2016 a total of 2,693 major quakes were recorded around the globe at an average of 168 per year, once again if this year continues to average 8 major quakes per month, 2017 would finish on 93, which would be 75 less than the 21st century average yearly total. The last time a yearly total of major quakes fell below 100 was way back in the 1980's.